Traditional castile soap is a gentle mild soap made with 100% olive oil, with a low creamy lather. By adding a small amount of castor oil to the recipe, we boost the bubbles while still retaining the mildness that makes castile perfect for those with super sensitive skin. 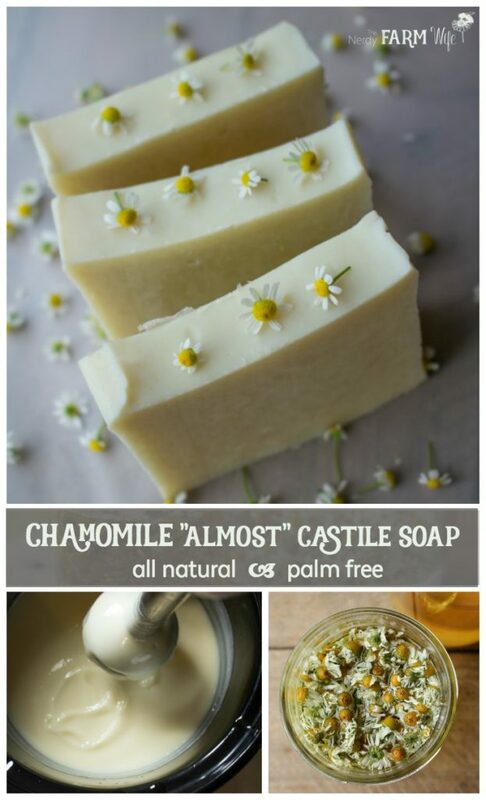 I chose chamomile for this recipe because it calms and soothes rashes and other irritated skin conditions. If you don’t have chamomile flowers or tea, try using another herb such as calendula, dandelion flowers, plantain or violet leaves instead. This is a great recipe for a beginner since it only contains two oils! Chamomile Tea: Fill a heatproof jar with around 1/4 cup of dried chamomile flowers or 2 chamomile tea bags. Cover with 10 oz (284 g) of simmering hot distilled water. Steep until the water turns a pretty yellow. Strain and cool completely before using in your recipe. 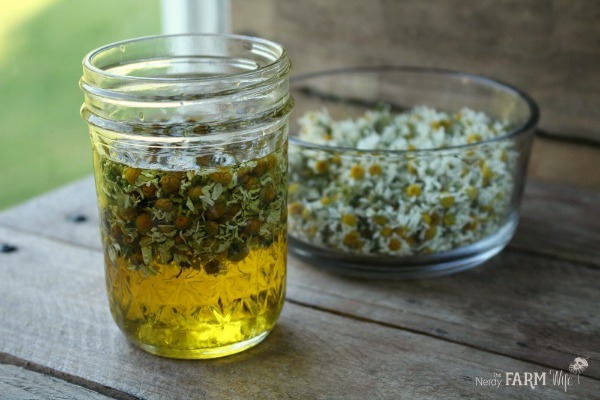 Chamomile-Infused Oil: Fill a canning jar about half-way with dried chamomile flowers or several chamomile tea bags. Pour olive oil over them until completely covered by several extra inches of oil. Cover with a lid and infuse for several weeks, then strain. For a quicker infusion, set the uncovered jar into a saucepan filled with a few inches of water. Heat the pan over low heat for 2 to 3 hours. Cool and strain. Use in place of regular olive oil in recipes. All measurements are by weight. You must use an accurate scale to make soap. * I use Red Crown, ComStar & Essential Depot brands of lye (sodium hydroxide). ** See my Essential Oils for Soapmaking Chart for more essential oils ideas & usage rates. 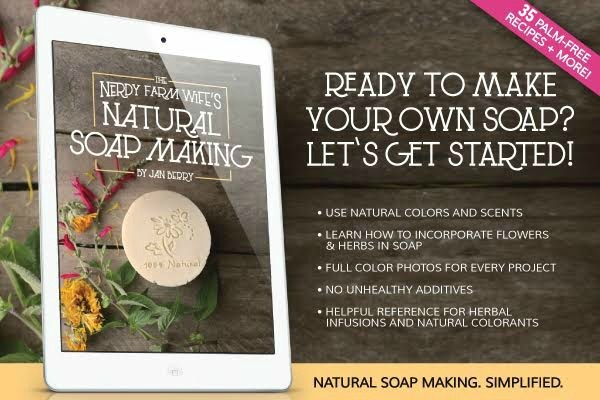 plus a small private Facebook group where you can ask me your soapmaking questions! Weigh out the olive and castor oils and heat gently until the temperature is around 90 to 100°F (32 to 38° C). Alternate with this method until trace is reached. “Trace” is when your soap batter gets thick enough to leave an imprint or tracing, when you drizzle some of it across the surface. Above is a picture of a soap batter at trace. Hand-stir in any essential oils, if using. After pouring, cover gently with a sheet of freezer or parchment paper, then a light blanket or towel to help hold in the heat. Peek at your soap every so often. If you see a crack developing down the middle, it’s getting too hot, so move the mold to a cooler place in your house. You might see the soap change from darker to lighter colors in spots and even take on a translucent, jelly type texture, especially in the middle. That’s all perfectly normal – it just means your soap is going through gel phase. After 24 hours, remove the freezer paper and blanket/towel, then let your soap stay uncovered in the mold for 2 to 3 days or until it’s firm enough to release fairly easily. If needed, you can pop the mold in the freezer for 4 to 6 hours until completely solid, then try removing. After unmolding the your soap, allow it to cure in the open air for a few days and then slice into bars. Castile and “almost” castile soaps need lots of cure time in order to harden and develop a better lather. Cure this soap at least 6 to 8 weeks before using, though an even longer time is recommended. If you’d like to ensure that your soap has a longer shelf life, add about 20 to 30 drops of Rosemary Antioxidants to the oils, before stirring in the lye solution. You can buy Rosemary Antioxidants from Mountain Rose Herbs. Since you only need a tiny bit per batch of soap, one bottle will last for ages and is well worth the extended shelf life it provides. 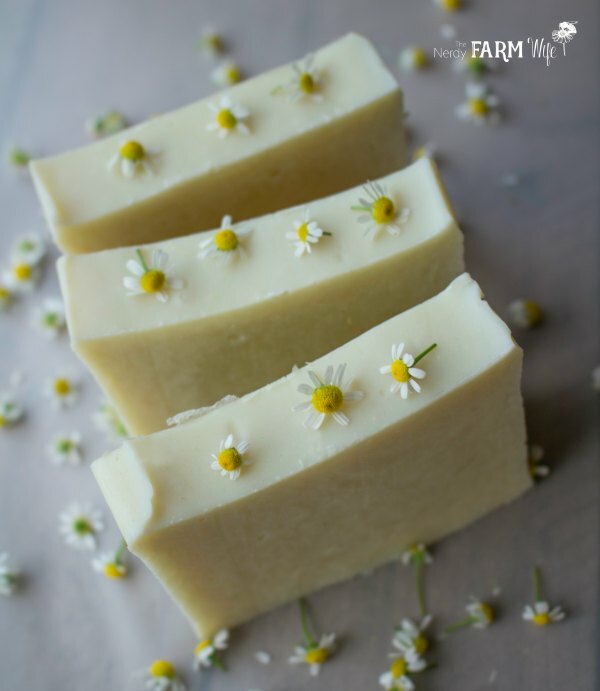 If you enjoyed this tutorial on making Chamomile “Almost” Castile Soap from scratch, let’s keep in touch! 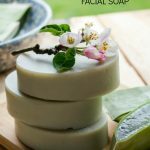 Subscribe to my newsletter and get my best herbal projects, natural soap ideas, and DIY body care recipes sent straight to your inbox, once per month. Tagged castile, chamomile. Bookmark the permalink. I love all your recipes and I try them all. With this one can you use Rosemary essential oil? Would it also help with a longer shelve time? Hi Deborah! I’m happy that you enjoy the recipes! That’s a great question about using rosemary essential oil instead of rosemary extract (ROE). So if you want to get anti-oxidant properties of rosemary, say in soap, you can either add rosemary essential oil to the oils, or ROE or rosemary extract (powdered) to some water and the effect is the same? The Swift Crafty Monkey blog has all sorts of solid information, so based on that, I’m prone to trust that rosemary essential oil will have some effect in extending shelf life. You just want to be careful to use rosemary essential oil within safe limits and not so it overpowers the scent more than you’d like. Dear Jan: I’m loving your blog. I’m learning a lot of new things with you. Its simplicity is contagious. Hugs from your new fan from Brazil. Love this! Thank you for the recipe! 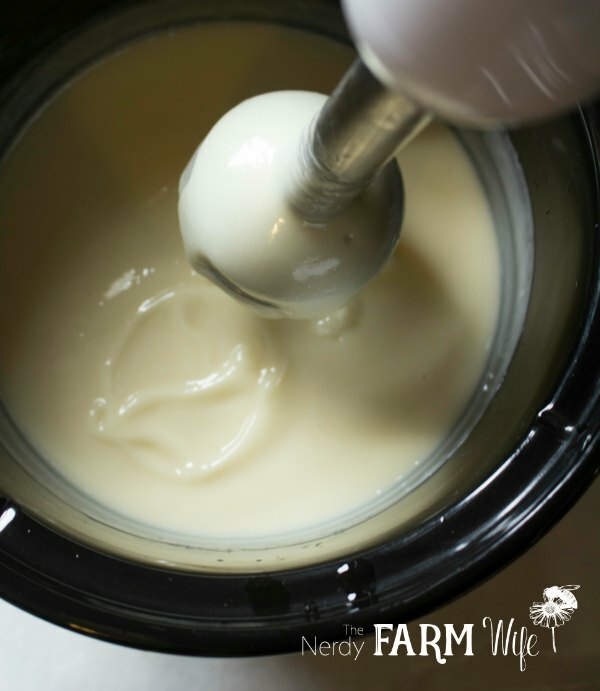 I love the simplicity of this recipe and how creamy it looks in the end! I also really love the suggestion for using violet leaf when chamomile flowers aren’t available. It’s one of my favorites for skin. =) <3 Thank you for sharing the recipe! I ordered the Ebook package, was charged $24.99 for it on my charge card but the downloads did not work. I can’t get back to the download page. What do I need to do to get my purchases. If I can’t get this resolved soon I will have to call my card company and file a dispute. Hi Renea, I’m so sorry that happened! I just sent you an email from honeybeehillfarm @ gmail.com with links to the files. If those don’t work or you run into any questions, just let me know & I’m happy to help! Hi Jan,I have just had the chance to see your blog for the first time,your recipes are amazing and I am still reading them ? I love your ebook and have been using the recipes as inspiration. I do have a couple of questions: 1).A shop owner mentioned that with some of the soaps she carries (not mine) the oils seem to kind of come to the surface, then get dusty. Ugh! Do you think it’s the essential oils, the base oils, or maybe lower quality fragrance oils? 2.) Since olive oil and others have a shelf life, do my soaps or does the saponification process lengthen shelf life? Thanks so much! Hi Janet! So glad you enjoy the ebook! The beading up or oozing out of oils/glycerin is somewhat of a mystery. I don’t use fragrance oils (though it’s very possible a few types could cause similar problems in soap) & have still had it happen a couple of times to me over the years. Each time, I noted the weather was extremely humid and hot & I’d also used tap water instead of distilled, so I feel those are two potential factors. Are the soaps exposed to air bursts from heating/cooling vents or perhaps some direct sun during the day? If so, that could be making the problem worse. and also keeping them stored in even temperatures & out of direct sunlight & humid areas. Hi Jan, I am just venturing into soap making. I have been researching this for months, ordered tons of soap-making supplies from Amazon and still fairly intimidated by the process. I always find myself overwhelmed with information on the Internet – but find myself back to your Website and recipes so often .. like a homing pigeon I fly back here. I live in Newfoundland, CA so I really have to order everything by mail – it’s so expensive for shipping and customs costs. Two questions: 1. What can I substitute for meadowfoam seed oil and 2. 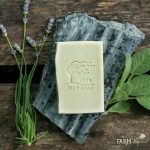 What is the shelf life of handcrafted soaps with essential oils? I love your Website, recipes, and e-book … it has become my security blanket LOL! Hi Lynda! I’m so glad that you enjoy the site & recipes! :) Instead of meadowfoam seed oil in recipes (which I use in fairly small amounts in my recipes), you could probably try something like sweet almond or sunflower oil, or perhaps hemp or avocado. If the recipe doesn’t have castor oil, then that’s always a nice addition to help increase bubbles & can be used instead. (I like to use castor oil around 5 to 7% of the oils in a recipe, or up to 15% for shampoo bars.) Just run those changes through a lye calculator, but if the meadowfoam makes up just a small portion of the recipe, it likely won’t be a significant change in lye. Shelf life of soap, with and without essential oils, can vary, depending on the freshness of the oils you start with. (Old oils = soap that goes rancid more quickly.) In general though, many soapmakers give an estimated shelf life of around 1 year. I’ve had some soaps last much longer though, and other times if I used an oil that was going off, the soap ended up with DOS (dreaded orange spots – that indicate it’s going rancid) much too early. (Which is always a sad thing!) You can add Rosemary Antioxidants to your soaps (For a 2.5 pound recipe, add 1 gram, which is about 1/4 tsp or around 40 drops, to the oils portion) to extend shelf life. Would this be gentle enough to not cause eczema flare-ups? Hi Lilliana! It’s a super gentle soap, but it’s hard to tell from person to person exactly how their skin will react. However, handmade soaps like this one, without fragrance oils or the drying effect of coconut oil are usually extremely well tolerated by those with super sensitive skin. hello, i love the simplicity in your recipe. AM sure going to try it out soonest. Many thanks…..id like to get your ebook too. This looks lovely! Can I use goats milk instead and if so would I use 8oz? And not insulate it? Also would this work in a silicone mold like the ones you have that say 100% Hand made? I have such a problem with details showing and air pockets. I also use sodium lactate. I like the simplicity of the mold for this soap. I just made a batch with one of you recipes, honey milk soap and tried to pour at a less thick trace to see if that helps with details in the mold. Any suggestions would be greatly appreciated. Thank you I just love your site! Hi KP! Yes, you can use goat’s milk instead – I think that would make a lovely soap. If you use frozen goat’s milk, I would weigh it so it’s 8.75 ounces, just like the water amount. You don’t have to insulate goat’s milk soap because it will heat up naturally on its own. Many people like to prevent gel in milk soaps by putting them in the fridge or freezer after pouring. 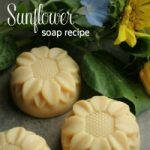 The soap would be wonderful in the 100% handmade soap molds! Mixing to a lighter trace will definitely help fill in the mold better and eliminate air pockets. You could try mostly hand stirring and only use the stick blender in brief very short bursts.